When you remove a reminder or flag, you’re saying in effect, never mind—this message doesn’t need special attention. The flag appears in the message list and in the message. 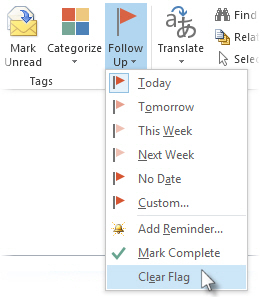 In the message list, right-click the message flag. 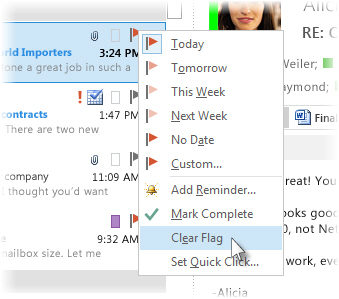 If the message is open in its own window, click Message > Follow Up > Clear Flag. When you remove the flag, the reminder is also deleted. 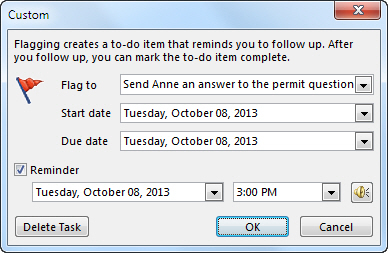 Reminders are pop-up alerts that appear when action is required. If the message is open in its own window, click Message > Follow Up > Custom, and then uncheck the Reminder box. 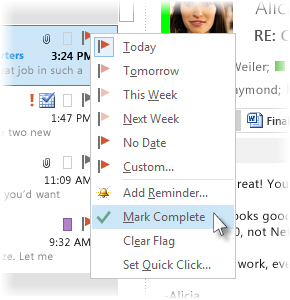 When you remove or clear a reminder or flag, you lose any indication the message was ever a to-do item. If you want an indicator that you’ve completed the action required for a flagged message, mark it complete instead. The flag becomes a check mark. In Tasks, you can change the view to see all completed items (until the item is deleted).